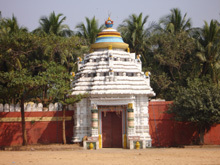 Gundicha temple is one of the most renowned temples in Puri. Being another sacred place of Puri, this temple is the key segment of the well known Rath Yatra festival (Car Festival) of Puri. It is located in the Gundicha square, near Puri bus stand. The exact geographical location of this temple is LONGITUDE 85050’33”E LATITUDE 19049’00”N. The temple is also known as 'Gundicha Ghar', 'Gundicha Mandir' and 'Sree Gundicha Temple'. Next to the Great Jagannath temple, the most important sanctuary of Lord Jagannath is the Sree Gundicha temple, the abode to which Jagannath, Balabhadra and Subhadra are driven each on his or her wooden car once in a year, during the car festival. Except for these few days, it is unoccupled, but there is a small establishment of servents by whom it is regularly maintained. It is situated at the other end of the great highway(Badadanda). The distance between the gates of Jagannath temple and the Gundicha temple is exactly 2,688.0696 metres (8,327 feet). Since the deities travel from Jagannath temple to Sree Gundicha temple, the Car Festival of Puri is also known as 'Sree Gundicha Yatra'. Gundicha Temple has some interesting legends related to it. One legend says that Gundicha was the queen of the King Indradyumna, the legendary founder of the 1st great Jagannath temple. It is because of the deep devotion of the queen Gundicha, Lord Jagannath prefers to pay a visit to her house for nine days during Car Festival. Another Legend says Gundicha Ghar is the house of Lord Krishna’s adoring aunt Gundicha. It is believed that their aunt gives a welcome to the three siblings with a special delicacy made of rice called 'padoapitha'. This rice cake is also known as 'Podapitha' or 'Porapitha'. This temple is regarded as equally holy as Jagannath temple as Lord Jagannth stays here for nine days during the annual car festival. The temple built in typical Kalingan style . The temple is sorrounded by a wall and stands in the middle of a garden. The height of the wall is 20 feet and width is 5 feet. The length of the temple is 430 feet. The height of this temple is 75 feet. The temple consists of four parts connected with kitchen rooms by a narrow passage. All the four structures (Vimana, Jagamohana, Natamandapa and Bhogamandapa) bear the traces of several plasterings and are carved in places with obscene figures in mortar. The whole temple is built of light gray sand stone. There is a plain raised seat, 4 feet high and 19 feet long, made of chlorite and this is called the 'Ratnavedi', the throne on which the images are placed when brought to the temple. This temple has two gates. The western gate is the main gate and the eastern side gate. The eastern gate is also known as Nakachana gate. The deities enter to this temple through the west gate and come out by the east gate. 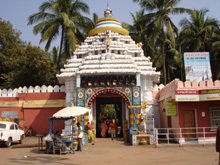 The temple is under the care and maintenance of Jagannath Temple Administration, Puri.